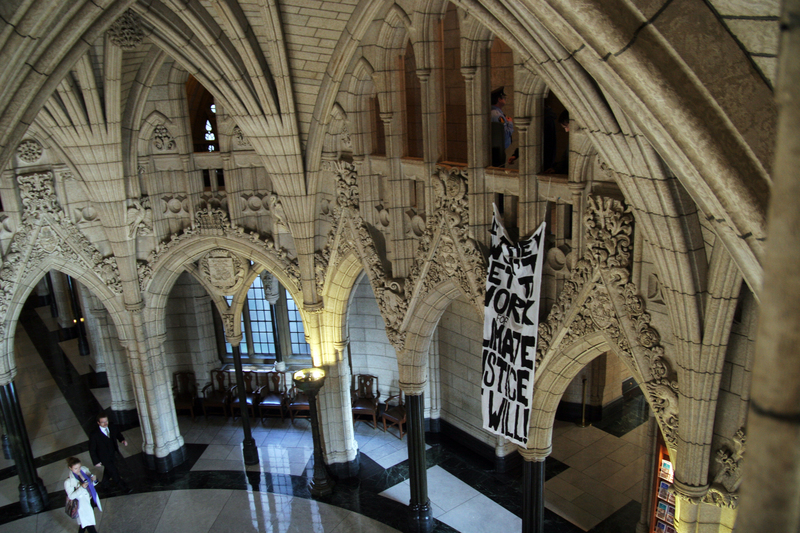 At 11:00 a.m. this morning organizers with Climate Justice Ottawa dropped a banner in the rotunda of the Canadian Parliament reading “If They Won’t Take Action on Climate Justice, We Will!”. 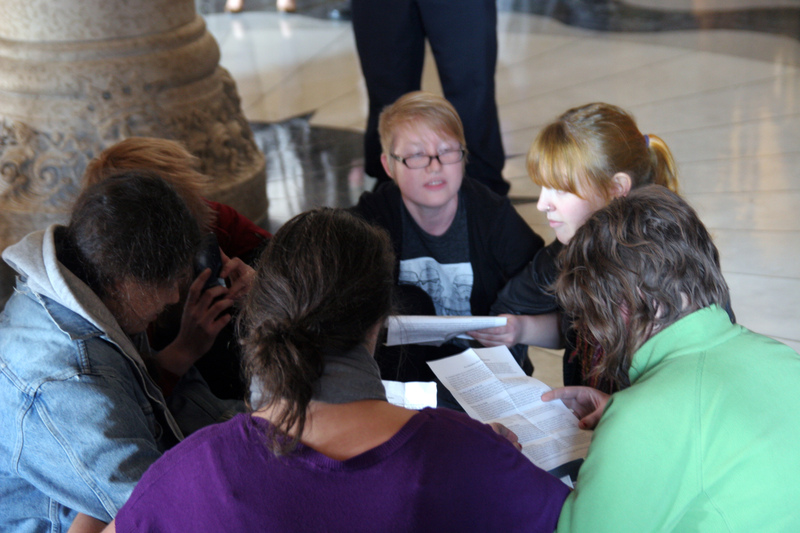 The youth also began a sit-in “Peoples Assembly” calling for Canadian politicans to begin open and sincere consultations with communities across the country. At the upcoming UN Climate Summit in Cancun, Canada should be the first nation from the global north to adopt the emissions reductions and temperature rise limitation targets of 300ppm and 1 degree celsius, presented by the largest gathering in history of directly impacted communities at the April 2010 World People’s Summit on Climate Change and Mother Earth in Cochabamba, Bolivia. The first step to achieving this and repaying our climate debt is accepting the Cochabamba Declaration text presented at the UN Summit. Tar sands developments are on course to destroy a section of the boreal forest the size of England, and are Canada’s fastest growing source of greenhouse gas emissions. The direct pollution from tar sands developments is poisoning the Athabasca River watershed and surrounding lands, and is a health catastrophe for impacted communities who areexperiencing high rates of cancer and a loss of traditional food sources. Therefore, we call for an immediate moratorium on present and future tar sands expansion projects, a phase out of existing projects, and to hold corporations responsible for environmental destruction while facilitating a just transition for workers out of destructive industries. Oil companies received more than $2.8 billion dollars in government tax breaks and subsidies in 2008. These subsidies lower the cost of oil and promote the use of dirty fossil fuels when we should be transitioning to clean forms of energy. Therefore, we call for an immediate end to government financing of environmentally and socially destructive industries. Canada currently relies heavily on technofixes, such as promoting biofuel projects where the amazon rainforest is slashed and burned to grow corn to put in our cars and investing over $3 billion in expensive and unproven carbon capture and storage technology. Furthermore, solutions such as carbon trading and offsets turn our atmosphere into a commodity to be bought and sold, allowing corporate lobbying to export responsibility for reductions to elsewhere and perpetuating inequality. Instead of wasting billions on band-aid solutions that ignore the root of the problem, Canada needs to take action at changing unequal and unsustainable systems of production, consumption, and distribution…. http://climatejusticemontreal.ca/wp-content/uploads/2016/05/CJM-JCM-Logo-2-300x80.png 0 0 Shona http://climatejusticemontreal.ca/wp-content/uploads/2016/05/CJM-JCM-Logo-2-300x80.png Shona2010-11-17 21:02:112010-11-17 21:02:11Climate Justice Banner Drop and Occupation of Parliament: "If They Won't Take Action on Climate Justice, We Will!"